We completed this puzzle ring bridal set for a client, Leslie, who wanted a very light blue sapphire, so light, in fact, that we were not able to find a sapphire that satisfied her. 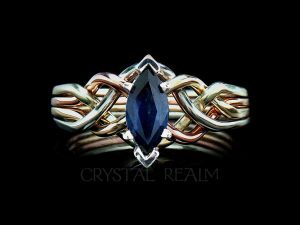 So instead of a genuine sapphire for the puzzle ring solitaire, she chose a lab-created sapphire which gave her the choice of several shades of blue. Leslie selected the lightest color, as she loved how much she could see the facets. She also opted for a diamond shadow band to go with her puzzle ring. We give you lots of flexibility, so you can acquire just the bridal set you want. For example, we can make this set for you with all genuine stones: genuine sapphire and diamonds. 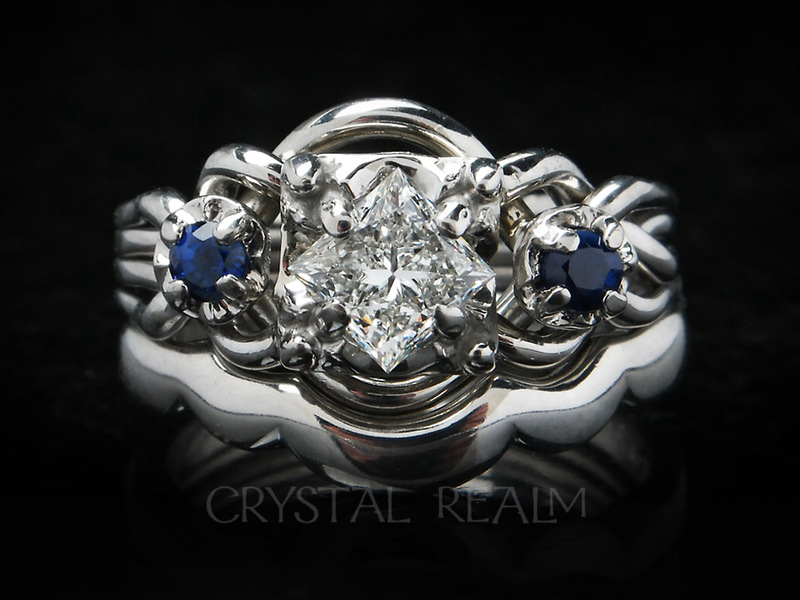 Or we can make it for you with all lab-created stones: lab-created sapphire with moissanites in the shadow band. If you prefer a marquise or princess-cut solitaire for your puzzle ring, you’ll have it! All of our precious metals are recycled, and you may choose from 14K yellow, white, or rose gold or platinum. Platinum is beautifully priced at present, much lower than it has been for about 15 years. So it’s a great time to buy platinum jewelry. 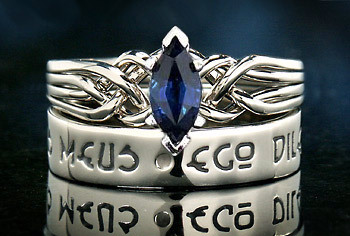 Sapphire engagement puzzle ring with 5mm lab-created sapphire and diamond shadow band. Choose all lab-created stones if you prefer or all genuine-stones. Contact Mandira with your wishes! We are excited about our new initials posy ring. The one shown in the image has her three initials and his three initials. We can do any combination of letters or symbols with a total of six. 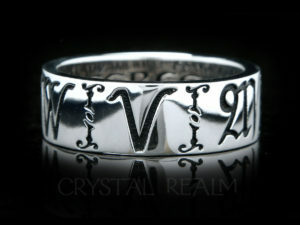 Custom posy ring with initials or name, exclusive to Crystal Realm. Available in your choice of width by special request or in a 6mm width on our site. Custom 14K white gold posy ring with initials or name. 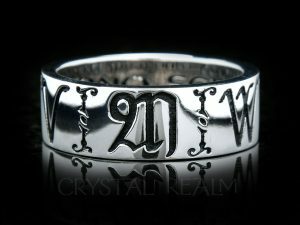 This ring is antiqued, meaning the letters and symbols are darkened. You may choose no antiquing if you prefer. 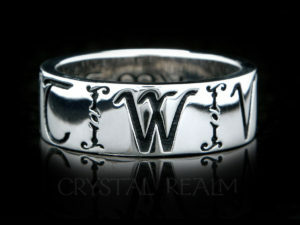 Exclusive to Crystal Realm – a 6mm wide initial or name posy ring. You may have up to six letters or symbols separated by Russian scrolls. Or . . . bring us your design idea, and we’ll bring it to life for you! Shown in 14K white gold, and available in 14K yellow or rose gold or platinum with or without antiquing. Antiquing is the darkening of the letters, and when the rings are not antiqued, the letters are light and sparkly. At long last, we have taken over the design and creation of our own shadow bands. Tom is now designing our shadow bands, which gives us much greater capability to develop new designs and respond to your desire for an original bridal set. Here is an image of the first shadow band that Tom designed from start to finish – working with the ideas of our clients who wanted a very specific band with a very particular meaning. This couple wanted exactly four trinity knots on her shadow band. The two on the outside represent the two of them. The two trinity knots in the center represent the two of them coming together as one in marriage. The shadow band is paired with her engagement puzzle ring, simply stunning with a 0.80Ct center Tsavorite garnet and two 5-pt accent diamonds. The puzzle ring is made of palladium and 14K rose gold. The shadow band is made of palladium. Palladium is a platinum-family metal that is naturally white, and we use it instead of white gold in bridal sets that have a white shadow band and a white (or white combination) engagement puzzle ring. Why don’t we use white gold for our sets? That’s another story, and you can find it below the image of this beautiful puzzle ring bridal set. 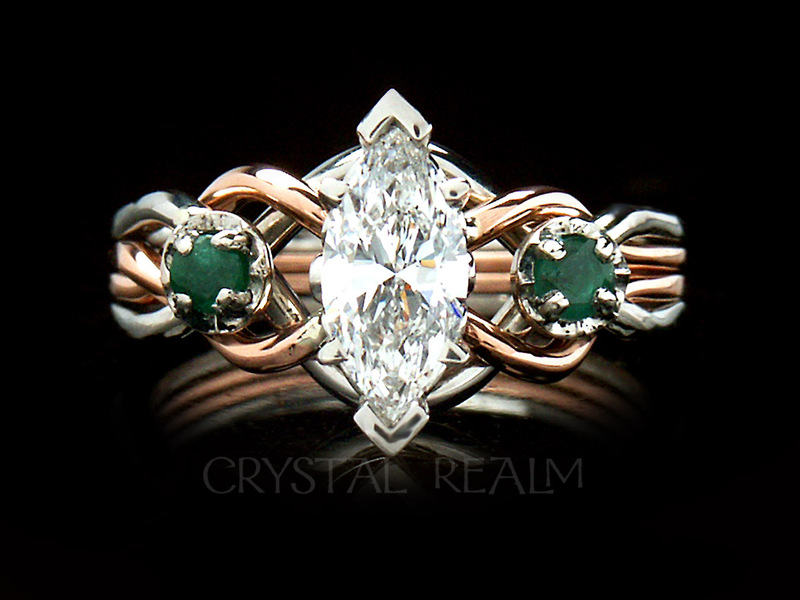 Marquise tsavorite garnet and diamond engagement puzzle ring with trinity knots shadow band all in palladium and 14K rose gold. White gold is not naturally white. Gold is yellow. 24K gold is 100% yellow gold. 18K gold is 75% gold and 25% alloyed metals. 14K gold is 58.5% gold and 41.5% alloyed metals. The alloys make the gold stronger, so the more alloys, the stronger the metal. However, when you want to make white gold, the alloyed metals have to not only make it stronger, but they have to make it whiter. They can’t make it bright white, though, because, after all, it’s still mostly yellow gold. Each manufacturer has their own formula for the alloys. 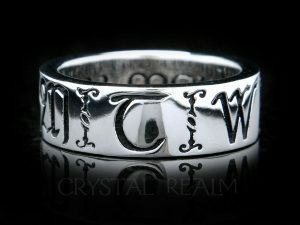 Therefore, each manufacturer’s white gold can have a slightly different “cast” (tinge) to it. Some white gold has a creamish (golden) cast; some white gold has more of a pinkish cast. The modern jewelry industry has decreed that all modern white gold will be plated with rhodium, another platinum-family metal that makes white gold rings, no matter their source, all a uniform bright white. This way they always match in color. However, our 14K white gold puzzle rings are not plated with rhodium. They have a slightly creamish cast to them. There are three reasons why we don’t plate our puzzle rings. 1. 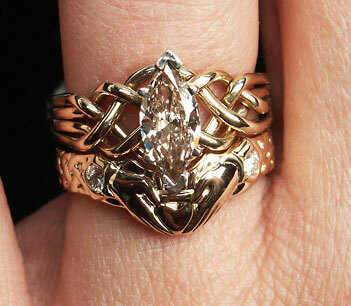 They are inspired by Celtic and Renaissance styles, and rings were not plated until the modern era. 2. We often do color combinations in our puzzle rings, and we can’t plate two bands while not plating the others. 3. Rhodium plating wears off, and most local jewelers have a bread-and-butter business of replating white gold rings 1-3 times per year. We don’t want to enslave you to having your rings replated over and over again. It’s expensive. Our 14K white gold puzzle rings actually happen to match our 14K white gold traditional and contemporary posy rings, which are not plated and which also have a slightly creamish tinge to them. But our shadow bands, even if we make them without rhodium, may not match our 14K white gold puzzle rings. As an example, one might be slightly yellowish, and one could be slightly pinkish. We use platinum or palladium for our shadow bands and mate them to engagement puzzle rings made of the same metal. This way our white metals match. The metal of the engagement puzzle ring will match the metal of the shadow band. We love moissanite for many reasons. It is gorgeous and more sparkly than diamonds. It is a sustainable, and conflict-free gemstone. (Let’s be clear, though, that all of Crystal Realm’s earth-sourced diamonds are conflict-free and ethically mined.) And they are affordable, especially when you get into the larger stones when compared with diamonds. Moissanite is a rare mineral found in nature, but the company that creates moissanite today does so in a lab. Each gemstone is artfully crafted, is socially responsible, and is eternally brilliant! We can make any engagement puzzle ring on our site that is shown with a faceted stone with moissanite. Currently, we have only a few moissanite rings listed in our store – under colored-gemstones, as that is also where lab-created colored gemstones are found. So until we get a dedicated moissanite section on our site, please feel free to email or call Mandira at 1-866-573-7381 with your needs. Great news! We were under the impression that marquise moissanites had been discontinued by their maker, but that is not the case. So we can use marquise, princess-cut, and round moissanite, as pictured in rings on our site. We can also use Asscher, cushion cut, and square (step-cut) stones. Here are examples of rings and moissanite shapes. Please note we make all of our engagement puzzle rings in all metals: 14K white, rose, yellow gold, and four colors of 14K gold; palladium (an affordable platinum family metal); and platinum. Many of our clients order platinum moissanite rings, because they save on the gemstone and splurge on the metal. We also offer any combination of these metals that you wish to have. Another note: usually the sellers of moissanite publish either the carat weight or the millimeter size, but not both. One seller we don’t often buy from states only the carat weight. The seller we are able to get better prices from publishes the millimeter size. I know how to cross-reference some but not all of the sizes and shapes yet. Marquise diamond engagement puzzle ring with a 0.70CT center stone and accent emeralds shown in platinum and 14K rose gold. A 0.70CT marquise moissanite is usually 9mm x 4.5mm. 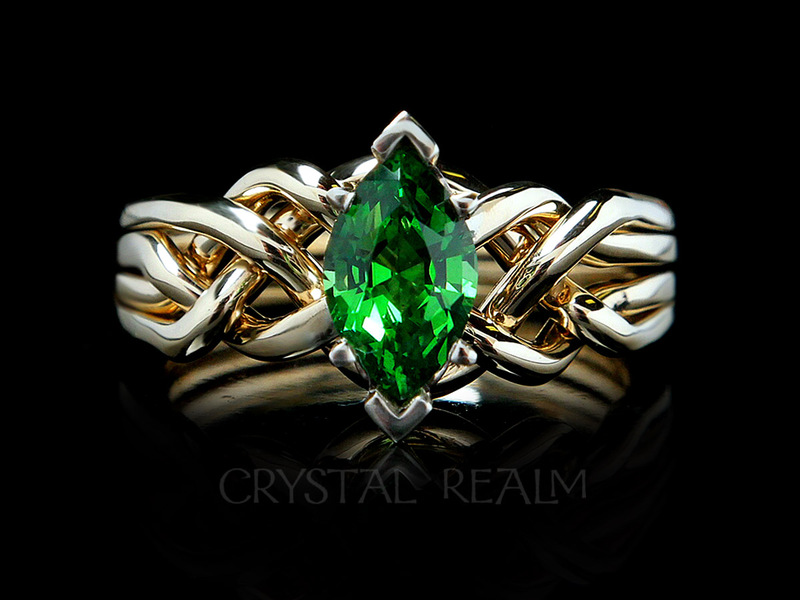 We can make this ring with or without side stones, which may be moissanite, lab-created emerald or the gemstone of your choosing. 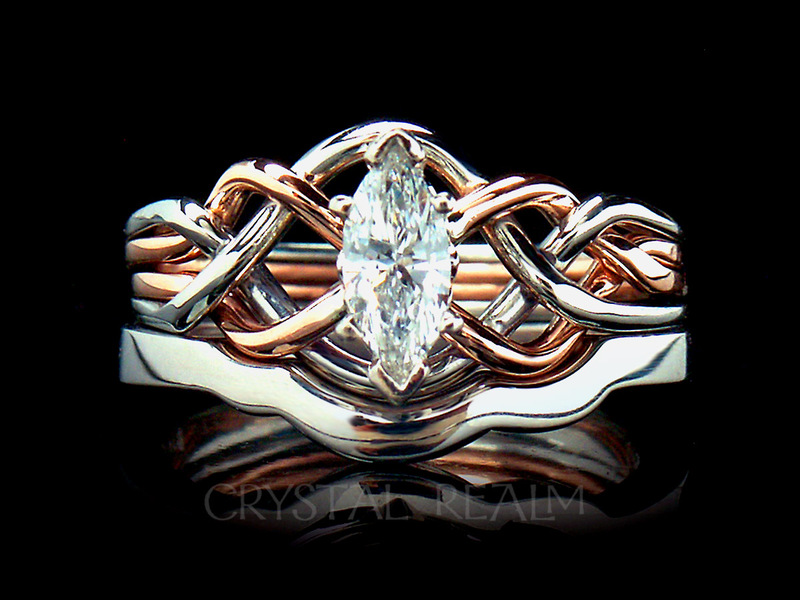 Tightly woven marquise four band, palladium puzzle ring. This is shown with a 1/3CT stone, but you can have up to a 0.70CT moissanite on this ring. Prices for this ring with moissanite are as follows: 0.35CT in palladium $1,358; in platinum $2,358. 0.50CT in palladium $1,475; in platinum $2,475. 0.70CT in palladium $1,925; in platinum $2,925. 0.1CT in palladium $2,200; in platinum $3,200. Please call for pricing of higher carat weights. 0.06CT round moissanites in the cuffs. Please call 1-866-573-7381 for further pricing on moissanite rings. As mentioned, you can select any engagement puzzle ring on our site, and we will make it in moissanite for you, in the precious metal or metals you want, with the size of moissanite you want, subject to availability. Sorry, we cannot do sterling silver with faceted stones. 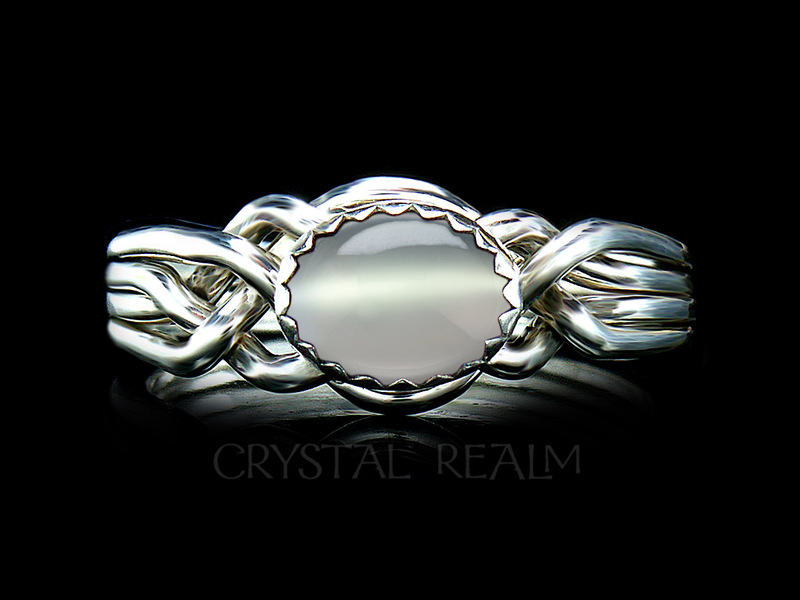 Sterling silver is not strong enough in a puzzle ring to bear a faceted stone with the setting it needs. Sterling silver will wear out far too quickly to justify the price we’d have to charge you, because most of the cost of our puzzle rings is in the labor and the stone. princess cut moissanite in palladium and 14k rose gold. 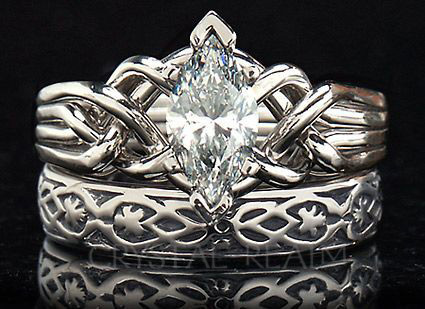 A medium weight, four band engagement puzzle ring in a Guinevere style with a princess cut diamond and an open weave. This is shown with a 1/2CT solitaire. Three-quarter carat princess cut diamond, four band, engagement puzzle ring. The smallest moissanite we can set in this ring is a 0.90CT. The next up is 1.20CT, then a 1.50CT, then a 1.92CT and so on up from there. heavier puzzle ring for about $1,697. A six piece Athena Royale puzzle engagement ring bears a large center moissanite (0.80CT) and two accent moissanites – all in platinum. 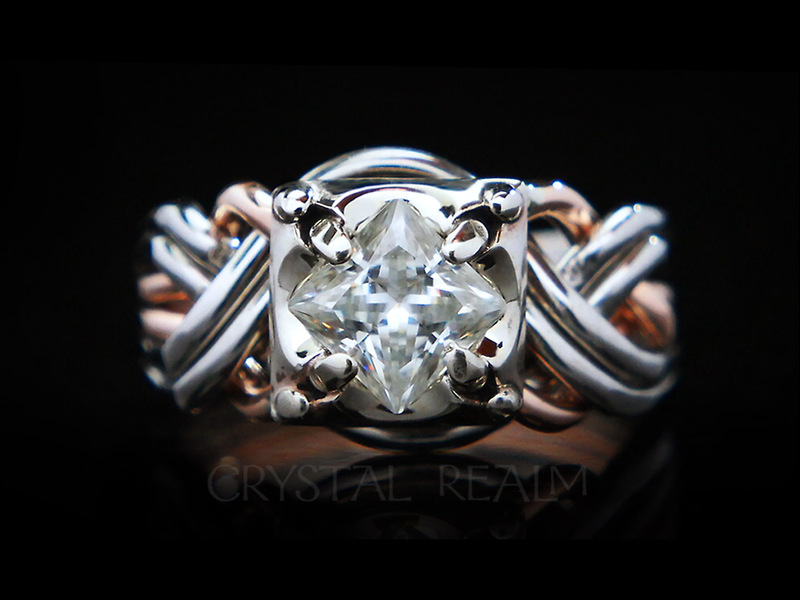 Round moissanite Athena puzzle ring. This brilliant round stone is 8mm in diameter and 1.9CT. A comparable diamond ring would cost tens of thousands of dollars, whereas this ring with a colorless (D-E-F color, top of range) in the 1.9CT is $3,297. 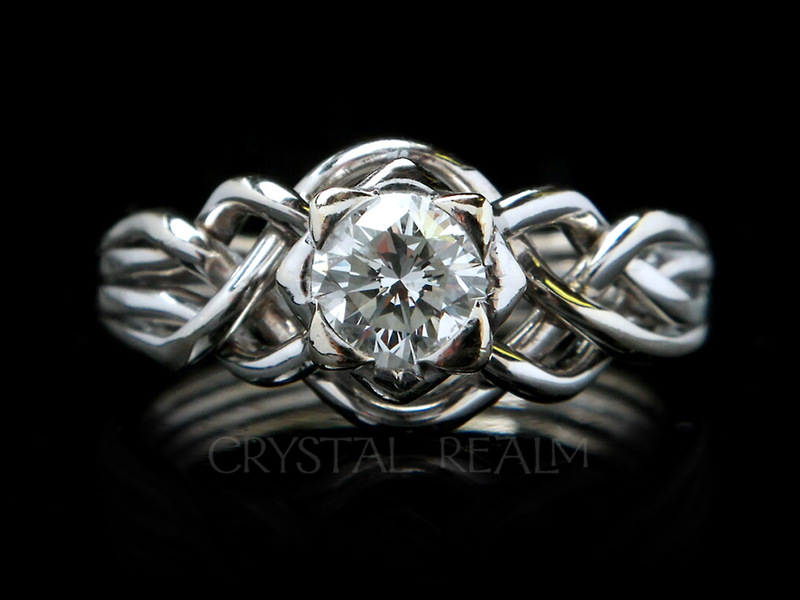 This ring is available in lighter puzzle ring weights with smaller round moissanites. little wider. The price of this set is $3,927 with this size center. It is also available in your choice of larger center moissanite. The modern diamond industry measures diamonds on several metrics that may be familiar to you: cut, clarity, color, and carat weight. They are known as the Four C’s. Below is a mix of “industry standard” information about the Four C’s along with how we think about the Four C’s – and a few other variables – here at Crystal Realm. You will learn how, when we select a diamond for your engagement puzzle ring, we guarantee that the diamond you get will be beautiful and sparkly on her hand. Cut is the most important of all the diamond characteristics, because it is responsible for the sparkle of each diamond. When cuts are beautifully done, it is said your diamond will have immense sparkle. There are five cut grades: Fair, Good, Very Good, Excellent, Ideal. We look for a cut of very good or better. When a diamond is not cut well, light entering the top (table) of the diamond will escape out the bottom or the sides of the diamond. When you have a good enough cut, light that enters the top of the diamond is reflected back and out the top of the diamond, and you will see a great deal of sparkle. An ideal cut diamond is available only in round and princess-cut shapes. You don’t need to have an ideal cut diamond to have wonderful sparkle. There is a ranking of which shapes of diamonds sparkle the most. Usually when you see this list, the shapes are called “cuts.” They aren’t cuts, they are shapes. The reason the shape is not the cut is that cut is a characteristic of every diamond, no matter the shape. 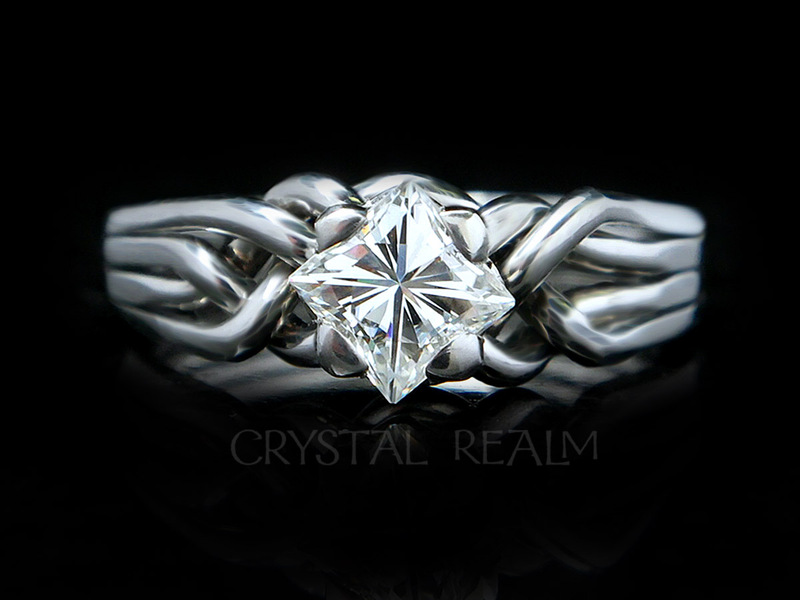 Click on links to see example puzzle rings or photos of the bolded diamond shapes that we use. Yes, occasionally we will set another shape than the ones shown in bold, but then we are using a setting that may be plainer or less in keeping with our “style” of ring. Extremely Brilliant: Oval, Marquise (pronounced Markee) and Pear. Brilliant: Cushion,* Emerald, Asscher* and Radiant. *Square shapes. We don’t currently have photos of cushion or Asscher puzzle rings, but we have set them. Cushion diamonds can be rectangular or square, and we need to use square ones, so we can set them in our ultra-secure Guinevere or Avalon settings. Why do we use so few shapes? The reason we usually only use round, marquise, and square shapes is because we are very picky about the settings we use. Most jewelers will tell you to stop by twice a year so they can check the security of the diamond setting. We have clients all over the world, so we can’t do that. We have to make sure that your diamond setting is super secure, and we have only four that meet our standards and our sense of style. The Guinevere and Avalon styles have four prongs that are heavier than most four-prong settings. We find that typical four prong settings are not secure enough to hold a stone. Our six-prong marquise setting has “V-prongs” on the ends. Most marquise settings do not. However, be aware that when a stone has points, it can become tangled in bedding – take your marquise off at night. And the marquise is the only setting that tends to have a potential for a bent prong if you hit it against the washing machine or the garage door, or get it trapped in a door as you close it. It costs money to return a puzzle ring to us to have us replace a stone – no cost for labor, only shipping and the stone – and we prefer that you never have to do that. However, should you damage your ring, we normally provide repairs at no or low cost. We generally charge only for materials we must purchase to repair your ring. We do ask that you insure all rings of value that you get from us. You would be surprised at how many lost rings we need to replace. I digress, but here is a reasonable solution for insuring your jewelry. Jeweler’s Mutual is the company that insures virtually every jewelry store in the country, and they also offer personal policies. They are reliable and easy for us to work with in the event of a loss (and no, I don’t get a cut!). 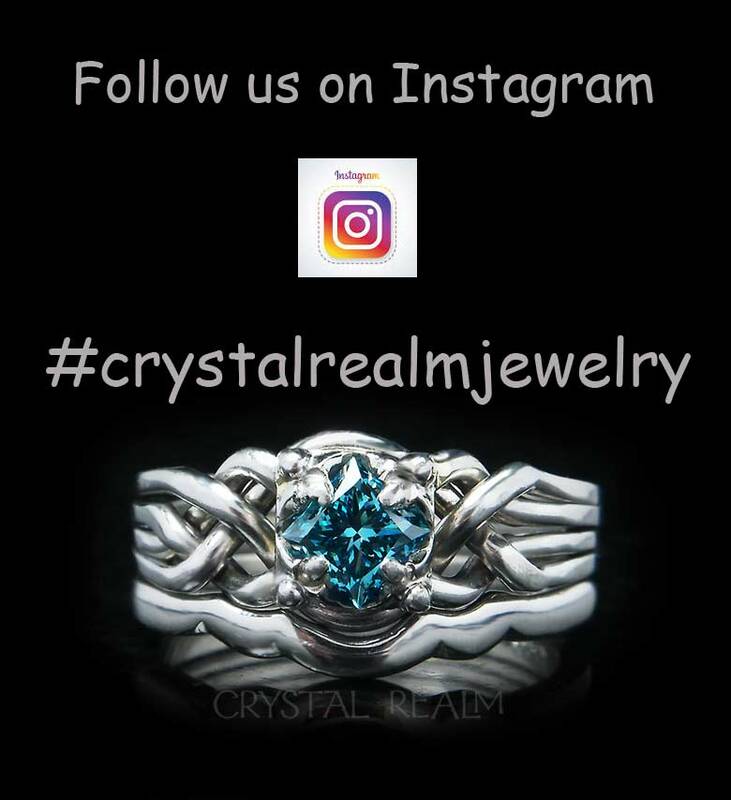 At Crystal Realm, we guarantee one of the following color grades for your puzzle ring diamond: D, E, or F color, which are the top three grades of the color range. There is no A, B, or C. D-E-F diamonds are colorless. In fact, at the top end of the range, diamond colors can only be identified by a trained gemologist with the correct equipment. You and I will not discern the difference between, say an D color and an F color. To the “naked eye” they look the same. In fact, you and I will not even discern the difference between an E color and a G color or an H color – the latter two of which are in the near-colorless range – for that matter. On the other hand, if you see a K color diamond, you’ll see a distinct yellowish tint, and at the very lower end of the range, R-S-T, you will observe the diamonds are yellow. About 2-3 times per year, we ask a client to consider accepting a G or an H color for the marquise diamond we place in the puzzle ring. If we ask you to consider this, it is usually for either a 1/3CT or a 1CT marquise. These sizes in marquise are considerably more rare than the more middling sizes. Instance #1. If a given diamond matches your needs perfectly in every other respect, and it has G or H color, we may ask you to consider it. Instance # 2. Sometimes we can save you serious money on a 1CT or larger marquise diamond by selecting G or H color. Diamond prices rise exponentially with carat weight. So a 1CT diamond is not twice as expensive as a 1/2CT diamond. A high quality 1CT-range diamond may be 3x to 6x the cost (ours) of a 1/2CT diamond. We naturally take a smaller markup on the more costly diamonds. Still, we find many of our clients want a diamond at the lower to mid-level of that multiplier range, and we may be more likely to save our client money with a G or H color. If we wish you to consider a G or H diamond, I will talk to you first about the very diamond we propose putting in your ring and what the rationale for this is. You may accept or decline. GIA master diamonds used to establish standards for color grading. From left to right, D to T.
Typically, we select a diamond with SI1 or SI2 clarity. These are diamonds with no inclusions visible to the unaided eye. What are inclusions? They are the tiny internal blemishes that tell you your diamond is a genuine, earth-sourced diamond. However, you do not want to see any inclusions when you look at your diamond on the hand. Here is a rough metaphor, loosely based on the knowledge that SI1 and SI2 diamonds represent the highest number of diamonds available. Imagine that a group of people threw 100 darts at a dart board. Maybe one dart would land in the red center of the bulls eye. This would represent an IF, or internally flawless diamond. About 15% of the darts would land on the green of the bulls eye or very close to it. 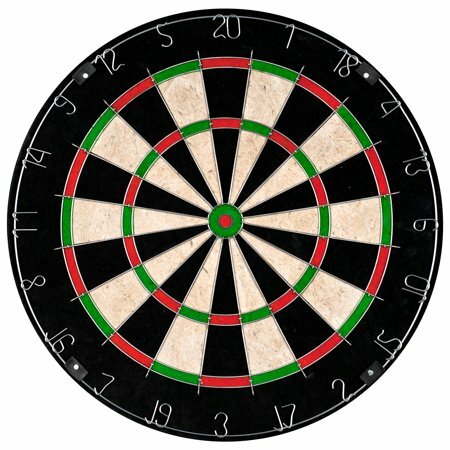 The majority of the darts (about 68%) would be further out in the black and white rays of the board. These are the SI1 and SI2 diamonds. The darts that land around the very outside black row (about 16%) are the lower clarity diamonds in the SI3, I1, I2, I3 range. I range diamonds are usually used in industry. You might want to skip the next paragraph, if statistics leaves you cold! I’m kind of geeky, so I actually like statistics, though some parts are still confusing to me after five stats classes. If you are a diamond industry expert, you might quibble with my description based on the numbers. But I am merely presenting this information to illustrate, again, that SI1 and SI2 diamonds are more readily available and thus more reasonably priced than higher clarity diamonds. Let’s call this another metaphor. If you are familiar with statistics, you know the normal curve, a bell-shaped curve which shows the probability distribution of a continuous random variable, in this case, all the rough and cut diamonds in the world. 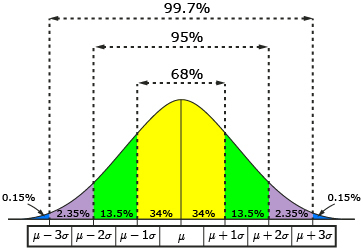 What this means for diamond clarity is that the highest proportion of diamonds are represented by the approximately 68% of diamonds in the yellow area up to one standard deviation from the mean (the center vertical line) in the illustration below. These are the SI2 and SI1 diamonds – no inclusions visible to the unaided eye. We’ll say the VS diamonds which are one step up the clarity scale are the ones falling in the right hand green area, up to two standard deviations from the mean. These represent approximately 13.5% of all diamonds. VVS clarity diamonds will fall in the right hand purple area up to three standard deviations from the mean (These are about 2.35% of all diamonds). And IF, or internally flawless diamonds, are exceedingly rare, and they occupy the tiny tail in blue on the extreme right of the illustration below. They represent perhaps 0.15% of all diamonds. Likewise, lower clarity diamonds represent the green, purple, and blue tail on the left side of the illustration. These would be SI3, I1, I2, I3 diamonds. What does this mean for you? We can save you money by selecting a diamond that is in the yellow center of the range. Since SI2 and SI1 diamonds are more plenteous, they are priced more reasonably than higher clarity diamonds. And since you cannot see any inclusions unless you use a microscope (and don’t – allow the illusion of perfection to exist undisturbed in your mind), your diamond will be equally as beautiful on the hand as a higher clarity diamond. She does deserve the best, actually, but wouldn’t it make more sense to get more of the diamond characteristics that make it look more beautiful on the hand? Those are cut and color. If you come to me and you want a very high clarity diamond, as some of our clients do, I’ll get you exactly what you want. There can be an emotional boost and sense of pride in owning a more rare diamond. But if you want to save money, understand that the tinier inclusions that you and I could only see at 25x will not translate to greater beauty on the hand. Why? Because once a diamond has no inclusions visible to the unaided eye, it doesn’t get prettier with tinier, harder-to-see-under-a-microscope blemishes. A client once said to me, “Isn’t clarity what gives the diamond sparkle?” Actually, no, as mentioned previously, sparkle is provided by the cut. On the other hand, many jewelers purchase “lots” of diamonds, which are bags of diamonds of varying quality. A “lot” of diamonds may have diamonds with really low clarity (the green and purple on the left side of the normal curve), many in the middle SI2 and SI1 range, and a few in the VS or VVS range. They will have colors across the range from yellow or yellowish to colorless. These jewelers must sell all the diamonds in their lot, in order to make their profit. So they may try to sell you diamonds with lower clarity, color, and quality. They may cover an inclusion with a prong of the setting. We do not purchase “lots” of diamonds. We individually select each and every diamond that goes into one of our puzzle rings. If, when it comes in, it doesn’t meet our standards for beauty and sparkle on the hand, we send it back and order another. If you order a diamond of 0.70CT or greater, we will send you links to videos of the several diamonds we are considering for your ring. This way you can have a part in selecting your diamond. Upon occasion we will also do that for smaller diamonds, but we don’t do it as a routine. We will never, ever cover a visible inclusion with a prong. Carat weight is literally the weight of the diamond, not the millimeter size. This is why sometimes two diamonds of the same carat weight will have different measurements in millimeters. For a long time, the U.S. media reported that the half-carat diamond size is the most popular in the U.S. Now they say a 1CT diamond is the most popular. I notice, though, that the latest report I saw only examined five of the largest cities in the country. Based on Crystal Realm statistics, with clients from rural and city areas in the U.S. and Canada, as well as our overseas customers, I observe the 1/2CT stone is still very popular overall. However, our results are skewed because most engagement puzzle rings on our site are shown in the medium weight, and this weight will hold a diamond or colored gemstone up to 0.72CT. The majority of our clients want the medium-weight ring, so they request a stone no larger than 0.72CT. 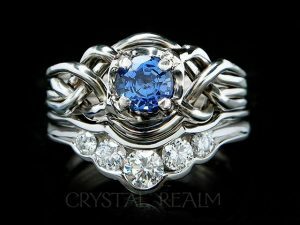 We love making rings with larger stones, though, so please ask us for what you want. When I talk with you about the engagement puzzle ring you want and the diamond or colored gemstone size you want, more than almost any other jeweler, I will talk to you about the weight of the engagement ring. By weight in this case, I mean the thickness of the puzzle ring bands. 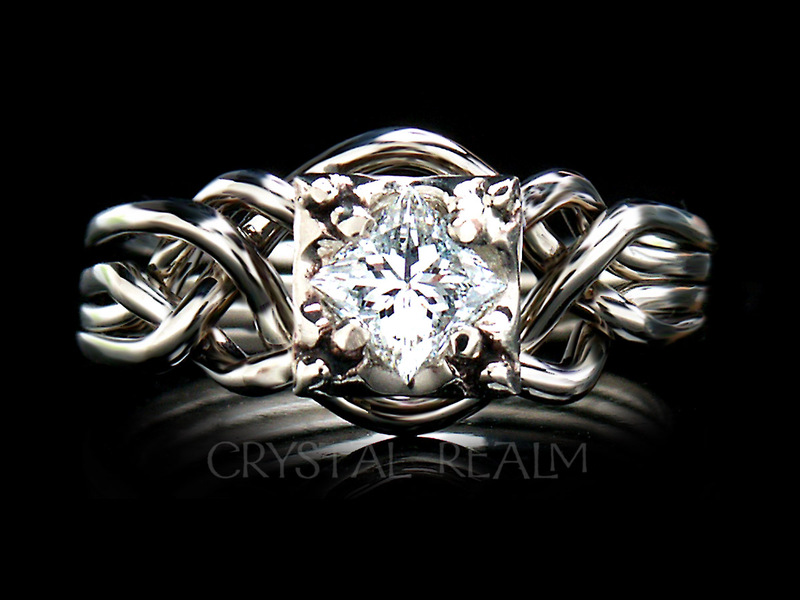 Here is the medium weight engagement puzzle ring that will hold up to a 0.72CT stone. For a 1CT range or greater engagement puzzle ring we offer three weights of puzzle ring. 1. Just-over-medium-weight, which will hold a 0.75CT to 1.10CT stone. Please note that the 1CT range goes from 0.90CT to 1.10CT. The stones we offer you could be anywhere in that range, and sometimes folks choose the lower end of the range, as shown in the photo below. This diamond has exceptional characteristics. 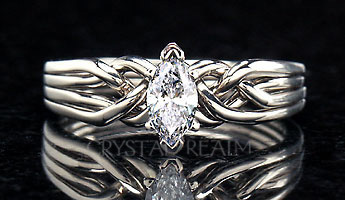 0.93CT marquise-diamond puzzle ring with optional diamond claddagh shadow band. This engagement puzzle ring has an open weave. A 1CT tsavorite garnet on a medium-weight 14K yellow gold puzzle ring with 14K white gold setting. This engagement puzzle ring has a standard weave. Heavy weight, which can hold up to a 2CT stone. One-carat marquise diamond on a heavy weight four band puzzle ring and paired with a 4mm wedding band shaped to fit with the puzzle ring. This engagement puzzle ring has an open weave. 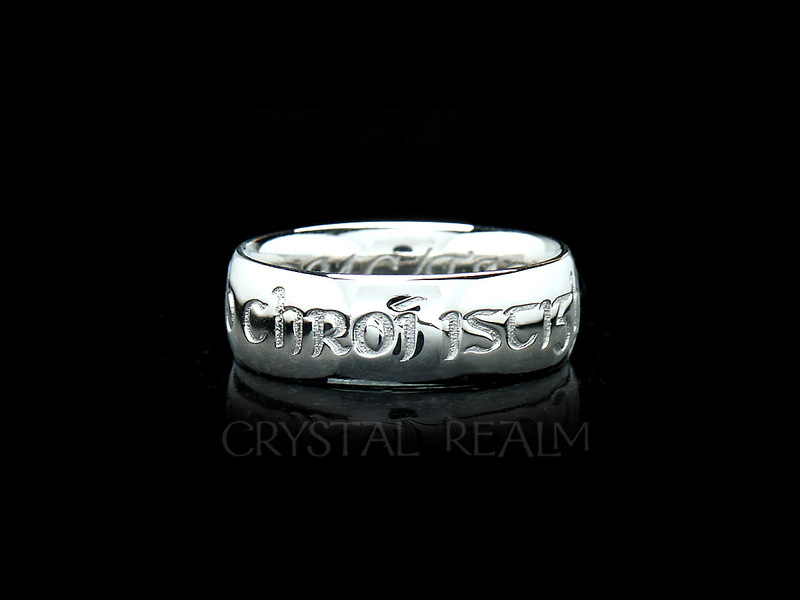 Today we might make a shadow band to go with this ring. For the marquise shape, we consider the length to width ratio. It is said the ideal marquise length to width ratio is 2:1. Occasionally a client will want a shorter, wider stone (such as the marquise tsavorite garnet shown above), but we normally will try to get as close to a 2:1 ratio as possible. For a square stone, we look for a very square stone. A princess-cut diamond may have a length and width of 5mm x 5.51mm. If we turn this diamond on its corner for a kite orientation (as in the diamond and sapphire Guinevere engagement puzzle ring shown above on this page), it won’t look right. It will look a little off. So we look for a diamond with no more than a 0.20mm difference between the sides, and we prefer no more than a 0.10mm difference. We’ll accept a 5mm x 5.10mm for your square stone. That is 1/10th of a millimeter difference, or 10/100ths of a millimeter. We might consider a 5mm x 5.2mm. But we won’t tolerate a difference larger than that. With marquise diamonds, we make sure your diamond does not have significant bow-tie. This is an optical illusion occurring in some marquise diamonds resulting from the cut. It appears as a black “bow-tie” across the center of the diamond. It isn’t “real” in that when you look at the diamond from another angle, it disappears. Some jewelers say a tiny bit of light gray bow-tie can give a diamond character, but we reject many marquise diamonds as we search for yours, as we don’t want your diamond to appear to have a dark band in the shape of a bow-tie across your diamond from any angle. We work almost exclusively with the diamond house that our puzzle ring maker has been working with since the early 1970s. This supplier provides ethically sourced diamonds and maintains tight control over their pipeline of diamonds. We are very proud to be able to offer you diamonds that you can feel good about acquiring and wearing. When buying a diamond, one of the most important things is to know your source. What our source says we will get, in terms of diamond quality, is what it delivers. This means that we don’t tend to be surprised when your diamond arrives. Our source guarantees that all diamonds of 0.37CT or 3/8ths carat are certified diamonds, include a diamond certificate, include one year of free loss protection, and have a serial number laser inscribed on the diamond. For diamonds lower than 0.375CT, which on our site are listed as 1/3CT, we are often able to offer certified diamonds with the same benefits as the larger diamonds. However, we use a little more leeway in ordering 1/3CT diamonds. Although we don’t carry many diamonds in stock, we sometimes purchase well-priced 1/3CT diamonds without much regard for clarity, say, as long as we can’t see any inclusions in them. This habit has resulted in occasional happy surprises, such as recently finding a diamond with SI3 clarity with phenomenal sparkle. One customer said to me, “I would never want an uncertified diamond, because they are junk!” This is not true if you purchase a non-certified, 1/3CT diamond from us. We will use our same standard of beauty and sparkle on the hand. If you are choosing a diamond of 0.70CT or above, we will be happy to send it out for your inspection prior to setting it in your ring. We will place an authorization on your card (possible with credit but not debit cards) in the amount of half the cost of your ring plus round-trip shipping. 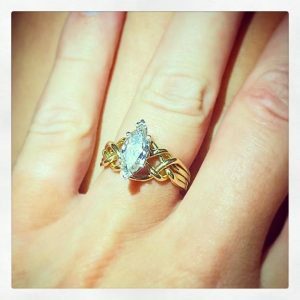 When we get it back, you will either get your deposit back, or if you are happy with the stone, we’ll apply the deposit to your ring. For smaller diamonds, we prefer to place the diamond in your ring and send it out finished to you. If you are not thrilled, we’ll take it back and replace it with another diamond. We insist that your diamond must sparkle. Yes, we covered sparkle under cut, but one more thought is in order. We value sparkle over color and clarity. If we carefully select your diamond, and it doesn’t sparkle beautifully, we will send it back and order another. Since our diamond source is trustworthy and they make it easy for us to characterize the diamonds we select, we have only done this once in the last almost 15 years. This is how we send out diamonds that our clients are happy with. I am intrigued by folklore, which can be defined as, “the traditional beliefs, customs, and stories of a community, passed through the generations by word of mouth.” On a less charming note, Merriam-Webster also suggests folklore can mean, “an often unsupported notion, story, or saying that is widely circulated.” Supported or not, through the ages, folklore the world over has held gemstones in high regard, attributing various powers to gemstones. Whether they have powers or not is apparently above my pay grade ; ) though I cherish their allure. My folkloric thought, entirely unsupported by evidence but making my work more fun, is that I think of looking for a diamond with a “friendly spirit” inside it. I think of this spirit as expressing itself in the magnificence of your diamond. As mentioned on some of our other pages, the four band, medium weight puzzle ring shown most frequently on our site holds a diamond or gemstone of up to 0.72CT. The very same puzzle ring in a slightly heavier weight holds a larger stone. This four band puzzle ring that you see most frequently on our site is the same, whether it is called a Guinevere, Marquise, Avalon, Athena, or Avon. 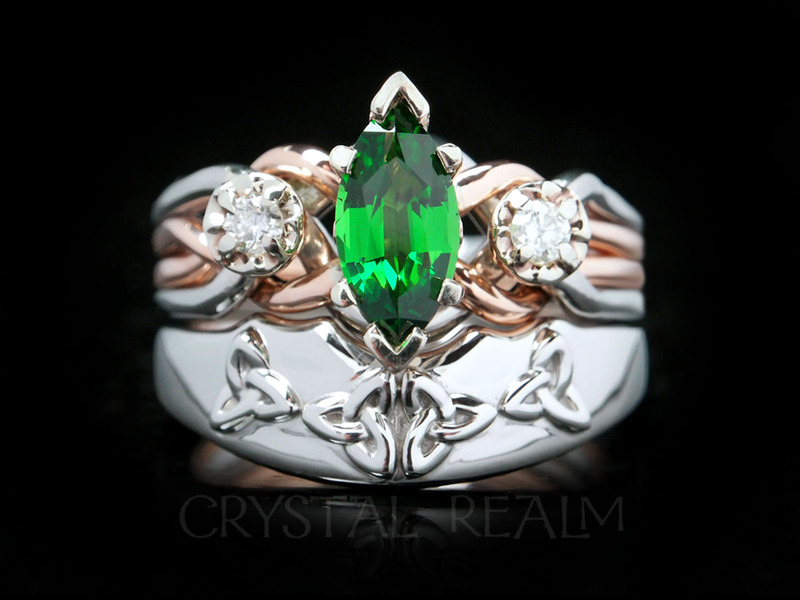 These rings vary by the setting that holds the stone, and each ring style is named for that setting. 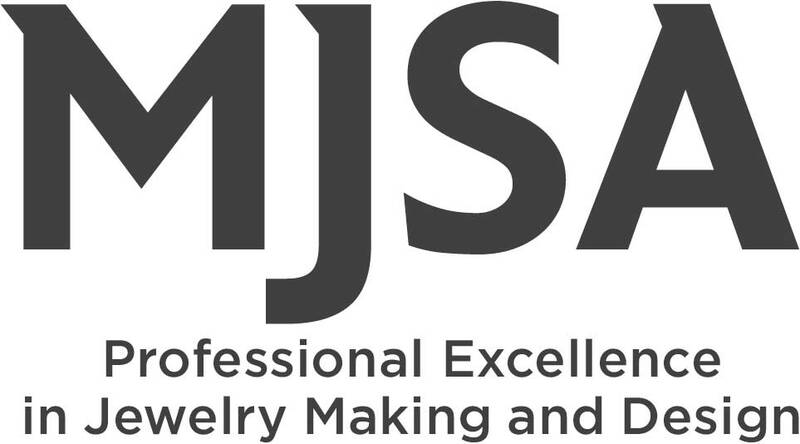 Please note that other jewelers will refer to the entire ring as the setting. 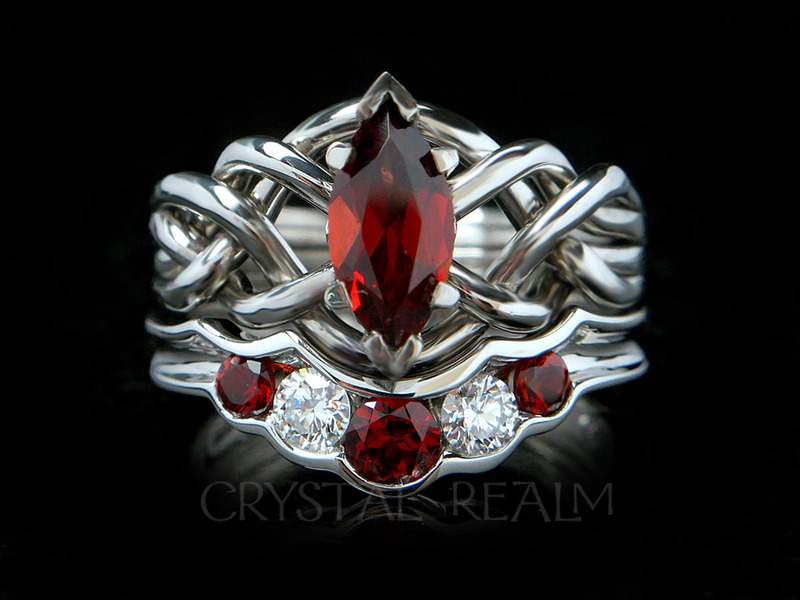 We refer to the puzzle ring as the ring and to the head that holds the stone as the setting. 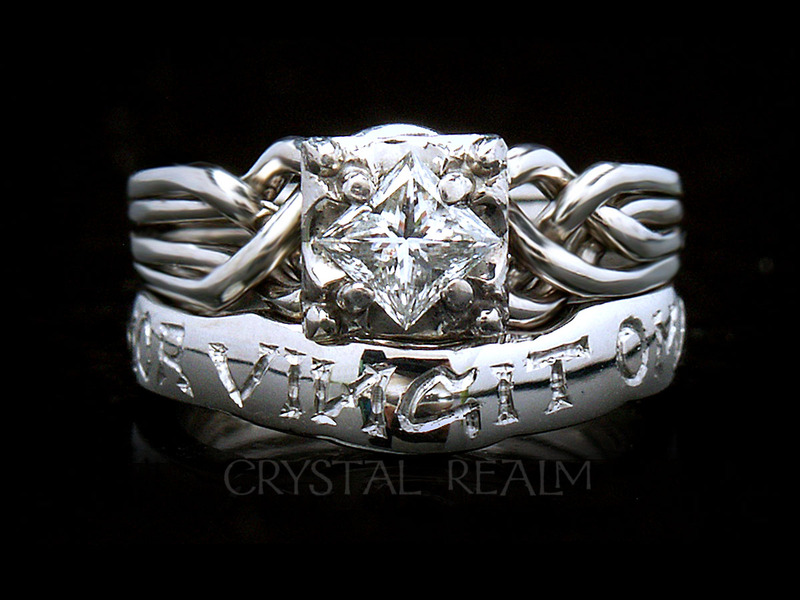 This page will introduce you to the Athena and Avalon puzzle ring styles. 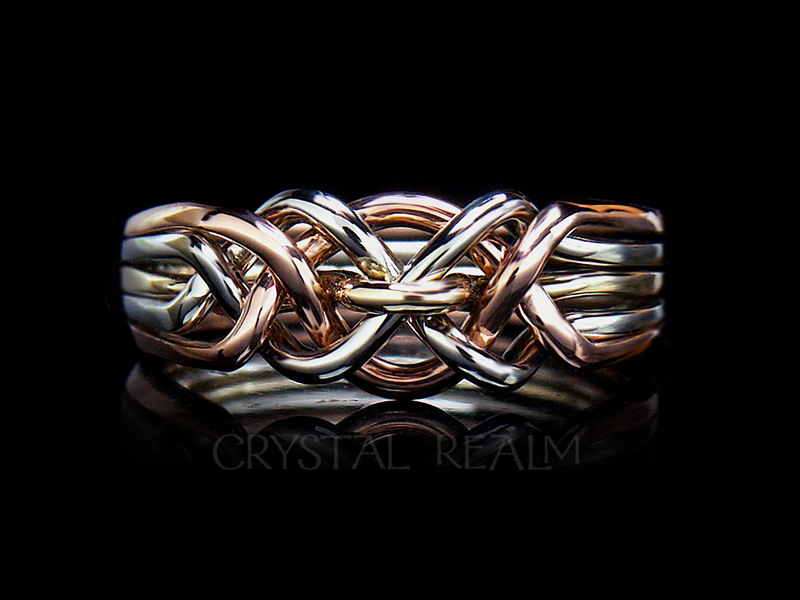 For both the Athena and the Avalon puzzle rings, you may choose from a tight or an open weave. We don’t tend to offer a standard weave in these rings, as it doesn’t lend itself well to these styles. 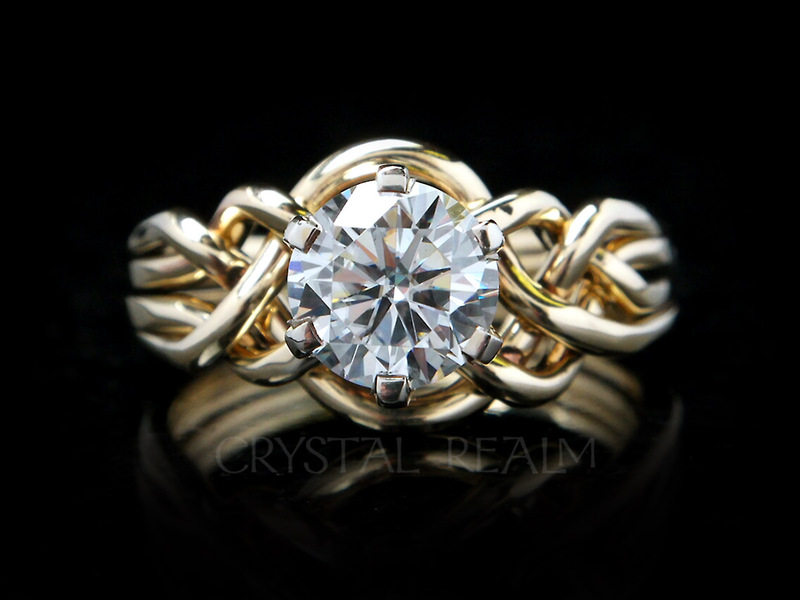 The Athena puzzle ring is characterized by a round stone held in a six-prong, crown setting. We like six prongs rather than four, because six prongs holds a stone much more securely than a four prong setting does. Most local jewelers will tell you, “Stop by twice a year for us to check your stone setting,” and they will tighten it up, if it is loose. We can’t do that. You may live anywhere in the world, so you can’t just stop by. Therefore, we must use stronger and more secure settings that will hold your stone securely. So far, we have not had a single customer report a lost stone or a bent prong on an Athena puzzle ring. I don’t think we’ve ever made an Athena with anything other than a tight weave, so I can only show images of the tight weave. 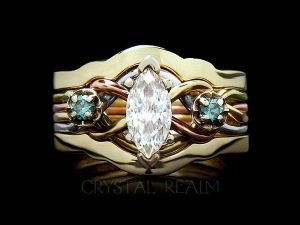 But if you wish to get an idea of what this ring might look like with an open weave, please refer to the open weave Avalon images below on this page. If you look at the overall shape of the puzzle rings with open weaves below, you’ll get a good idea of what an open weave Athena would look like. You can see how high off the ring the setting holds the center stone. 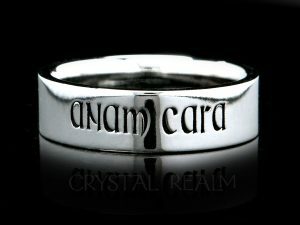 The height of the stone, including the bands of the puzzle ring may vary from approximately 8.2mm to 9.2mm, depending upon the carat weight of the stone and the weight of the puzzle ring. You can see how high off the ring the setting holds the center stone. The height of the stone, including the bands of the puzzle ring may vary from approximately 8.2mm to 9.2mm, depending upon the carat weight of the stone and the weight of the puzzle ring. With a half-carat stone on a medium weight puzzle ring, the total height will be approximately 8.4mm. a round brilliant one half carat diamond and side sapphires. 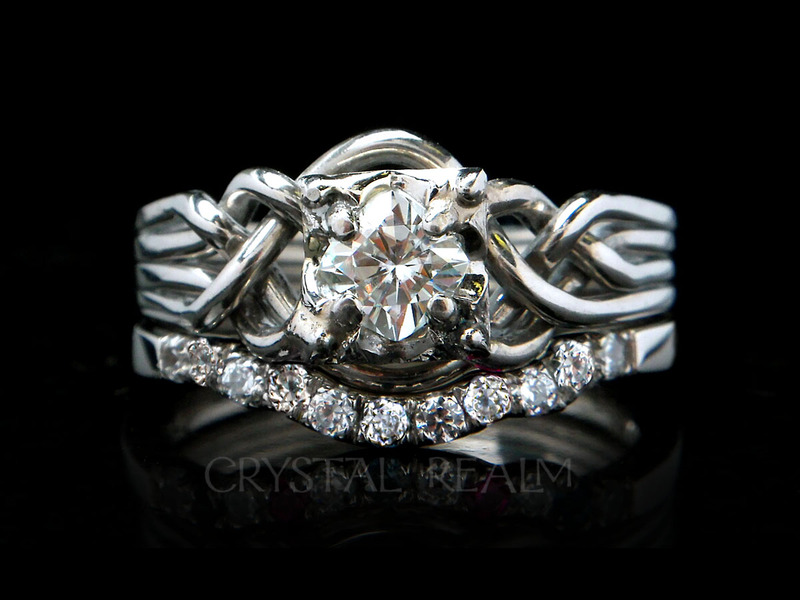 The Avalon puzzle ring is a four prong setting that is nonetheless very, very secure. This is because the prongs are very substantial and therefore very strong. 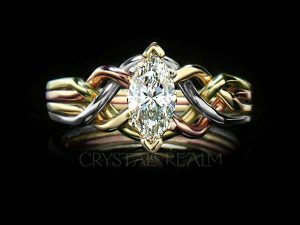 Our customers have so far never had a lost stone or a bent prong on an Avalon ring. The Avalon here is shown with a tight weave. The diamond size, for reference, is 6/10ths carat, or 0.60CT. 4 piece puzzle ring with princess-cut diamond in medium-low setting and palladium. This ring is shown with a tight weave. The Avalon looks especially pretty to me with a round stone, as you get this sort of lotus flower look when you look straight down on it, as pictured here. Granted you don’t often look straight down on it! But it’s nice to know it’s there. This diamond, for reference, is a one-half carat. The open weave gives much more width to the ring at top center. 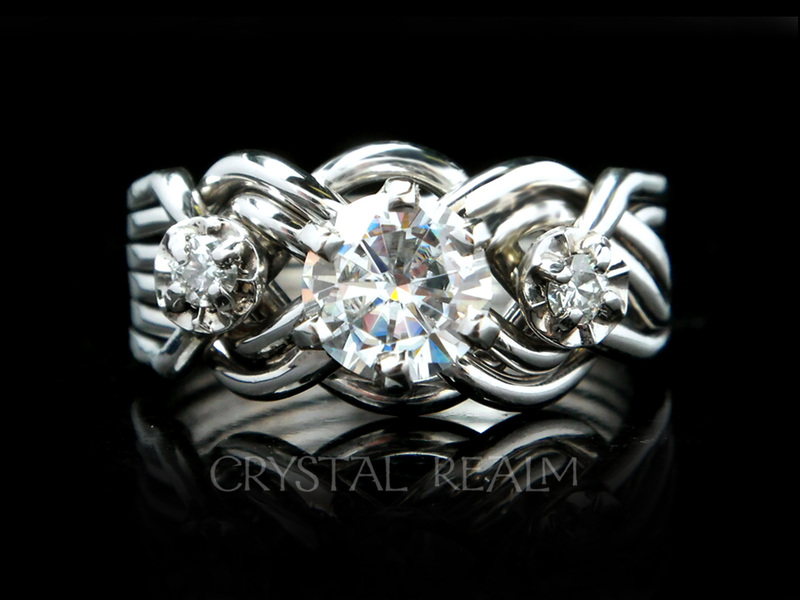 Four band Avalon puzzle ring with round brilliant diamond and open weave. Notice below that the setting is always 14K white gold, even when the ring is four colors of 14K gold, as shown here. This is because we don’t want the color of the setting to affect the color of the diamond or gemstone. Palladium rings have palladium settings; platinum rings have platinum settings. You can request a quote for a platinum setting on any ring. We can create the Avalon with any round or princess-cut stone you wish: diamond, moissanite (lab-created diamond), or a genuine or lab-created colored gemstone. Note this stone is set in the kite orientation, where the corners of the princess-cut stone are oriented to the N-S-E-W directions. and four colors of 14k gold. No matter what stone you wish to have, when you choose a princess-cut or square stone, we can orient it in the kite orientation shown above or in the square, parallel-perpendicular orientation shown below. Shown is a blue diamond in a 1/2CT weight. A side view shows that the Avalon setting is a medium-high. 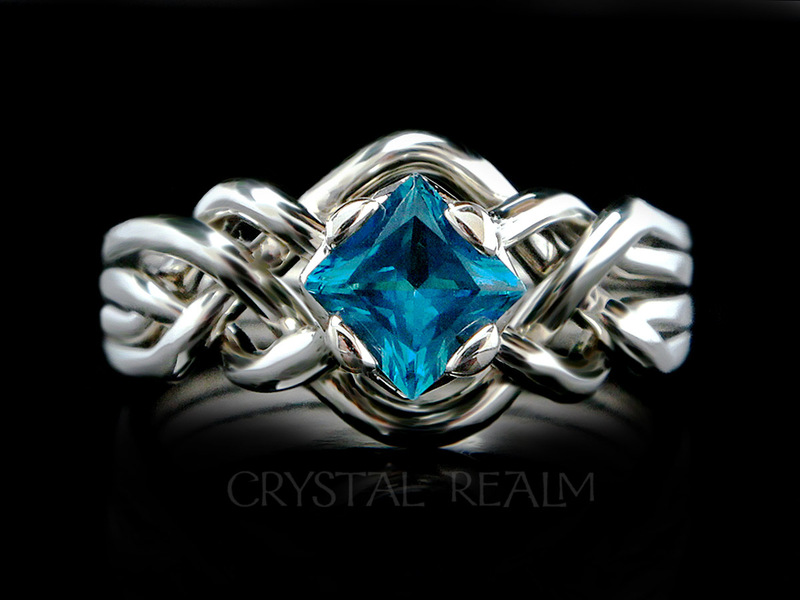 blue diamond ring is 5.4mm. Half-carat blue diamond, four band puzzle ring, side view. 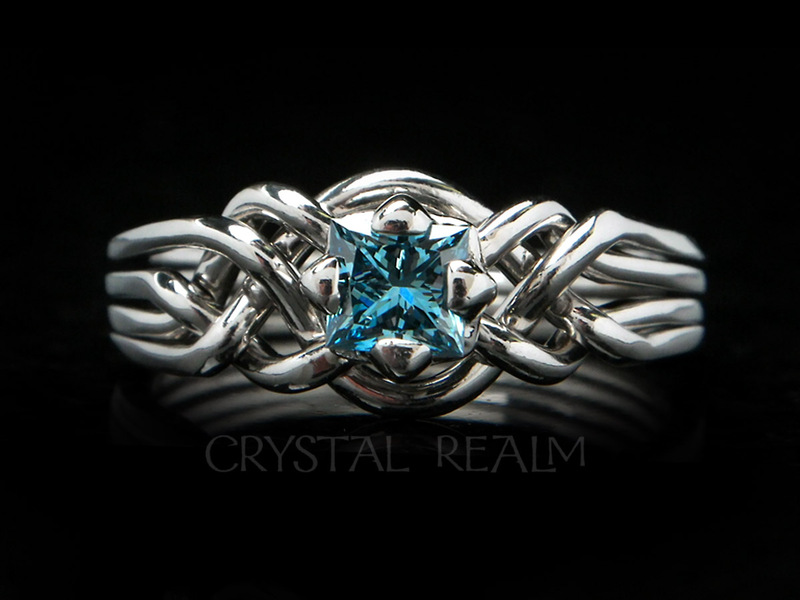 Here we show a 5mm, princess-cut, Swiss blue topaz on a just-over-medium-weight puzzle ring with an open weave. This stone is about 0.80CT, so it has to be held on a slightly heavier puzzle ring. 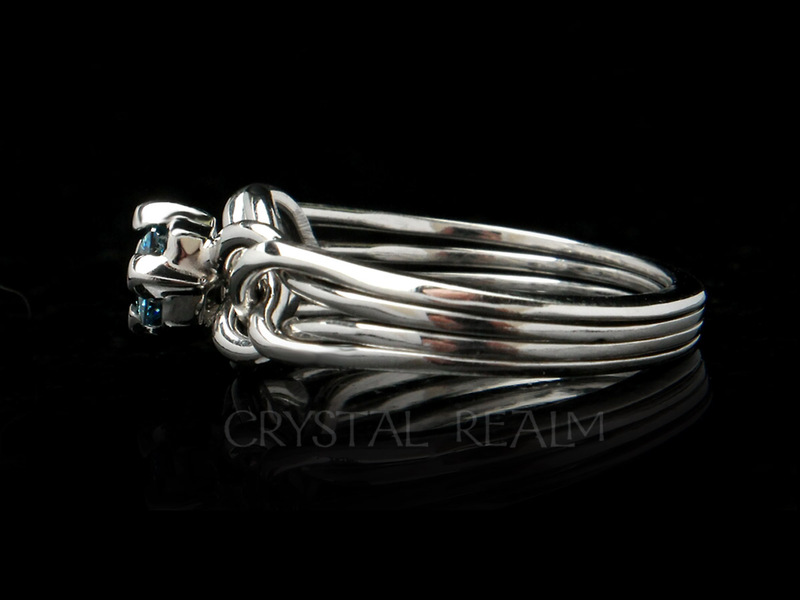 Blue topaz, four band puzzle ring with open weave in just over medium-weight. You may choose from an array of precious metals for your engagement puzzle ring and bridal set. You may have one metal or more, depending upon your taste. The metals you may choose from are 14K yellow, white, or rose gold; four colors of 14K gold (white, rose, yellow, green); palladium, or platinum. We are unable to make our engagement puzzle rings in sterling silver, because silver is not strong enough to bear a faceted stone and stone setting; plus most of the cost is in the stone and the labor, so you might as well get a metal that will last for decades not just a few years. 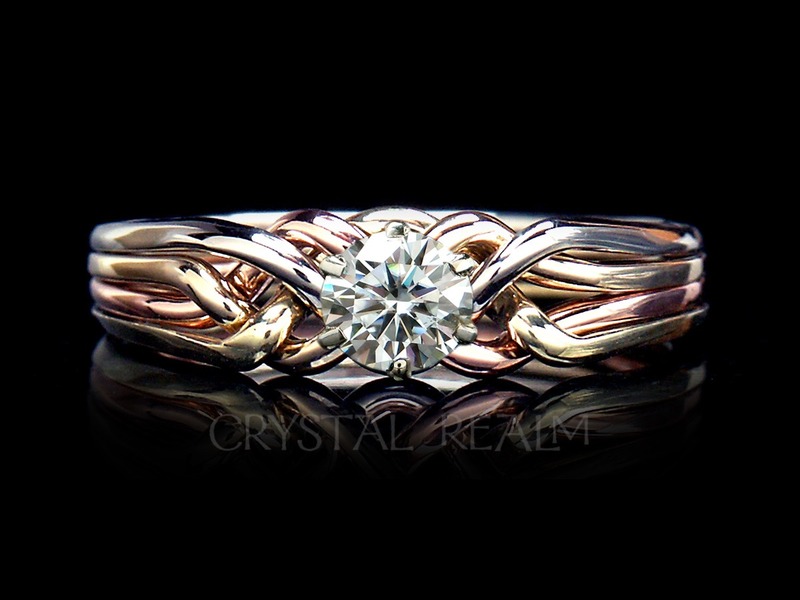 You may have combinations of metals if you wish: platinum or palladium with 14K rose gold are popular choices. 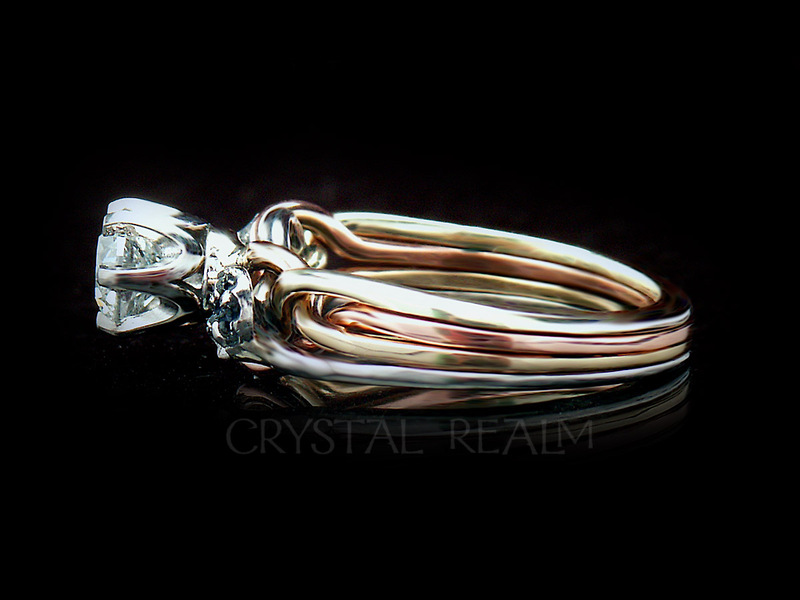 14K rose gold with 14K white gold is also popular. 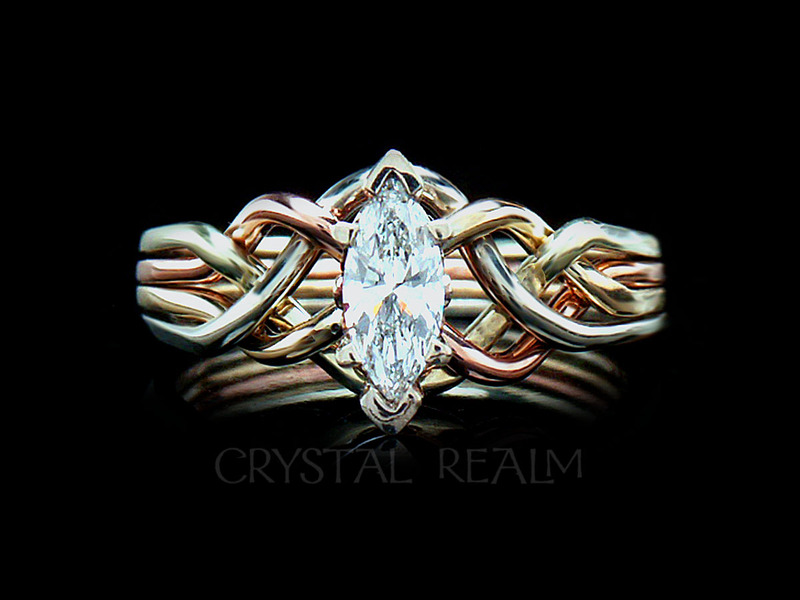 14K rose gold with 14K yellow gold provides intense color. This page, however, is primarily dedicated to helping you make your decision if you want a white metal or a white metal in combination with a colored metal. This is counterintuitive, but the white precious metal you get your puzzle engagement ring in NOW will depend upon the type of wedding band you ultimately wish to place with the ring LATER. Okay, I know, you’re not even engaged yet, so how do you know what kind of wedding band the two of you will ultimately want? Relax, this isn’t about choosing a specific style, it’s about choosing a kind of band. Even though it may be a tad early in your decision making process, this is important enough that I need you to give this some thought! Here are different types of wedding bands and the metal choices you have for the puzzle ring, so the two rings will match in color. Further down on this page, you can read about WHY we don’t recommend 14K white gold for all puzzle ring bridal sets or what we recommend if you must have 14K white gold. 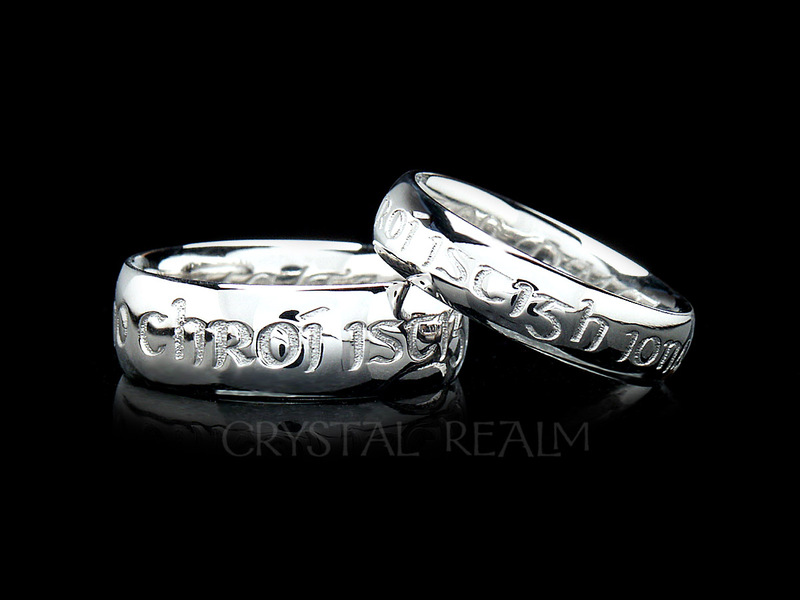 Celtic wedding band in any style: Palladium or platinum. 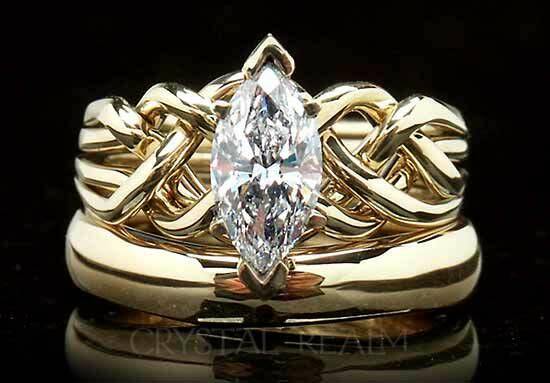 Marquise diamond puzzle ring with Irish Celtic claddagh band. Traditional or contemporary posy rings in any style: 14K white gold or platinum. A marquise diamond, four band puzzle ring with a 0.72CT size is paired with a traditional ‘yovrs onli’ posy ring, all in 14K white gold. Custom posy rings in any style: Palladium or platinum. Single or dual shadow bands with or without embellishments such as knotwork, diamonds, etc. : Palladium or platinum. Plain wedding band whether domed or flat: Palladium or platinum. Any style of wedding band from another jeweler: Palladium or platinum. Why? Why not 14K white gold for most of these bridal sets? Let’s start at the beginning. Gold is, well, gold – meaning gold is yellow! White gold is made from 24K yellow gold to which alloy metals are added to make it stronger and to change the color to white. Therefore, all 14K and 18K white gold is made from yellow gold, and, truthfully, when the alloying is done, and the metal is made, it’s not pure white. It has a tinge of yellow, what I call a “creamish cast” to the color. It can be really, really pretty. It can make for a softer color of white. But from gold manufacturer to manufacturer, the color can vary. This is because 14K gold is 58.5% gold and 41.5% other metals. 18K gold is 75% gold and 25% other metals. Each gold manufacturer has their own formula for their metal alloys, so gold maker A can turn out white gold with a creamish cast. Gold maker B can turn out white gold with a slightly different cast – maybe a slightly different yellow or even a pinkish cast. So two white gold rings from two different gold makers may not match in color. The modern jewelry industry, in all its wisdom, has decreed that all white gold jewelry pieces will therefore be plated with a white, platinum-family metal called rhodium. So when you go into a regular jewelry store, and you see all the bright white gold rings lined up, every single one of them has been rhodium plated. This makes for bright white gold, but it also means that it wears off. How quickly depends upon your wear patterns – that is, how hard you are on your jewelry. Most local jewelers have a bread and butter business replating white gold rings from one to three times per year. The problem for us and our clients is that our 14K white gold puzzle rings are not rhodium-plated. This is for a few reasons. First of all, plating will wear off a ring more quickly when a ring is composed of several bands that will be taken apart and put back together, perhaps occasionally, perhaps frequently. 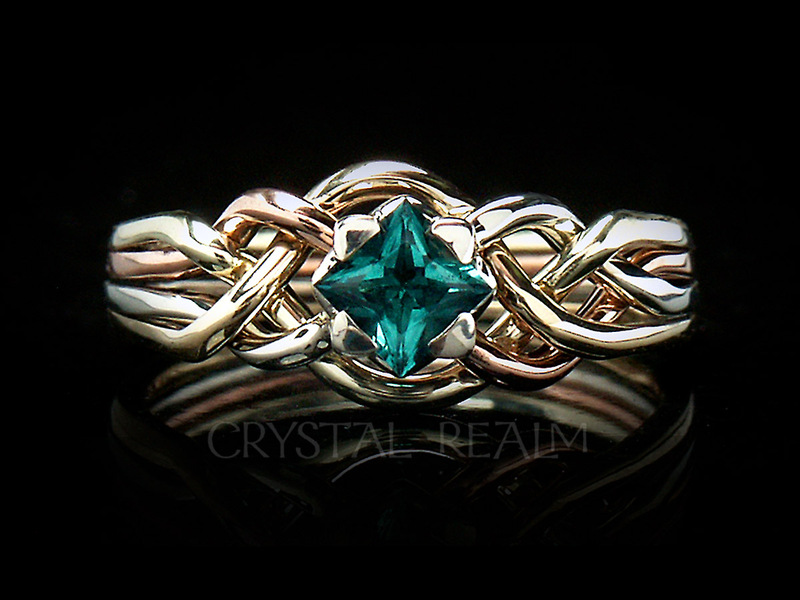 Secondly, we fancy ourselves to be makers of Renaissance style or Renaissance reproduction rings. Historic rings were yellow gold. Even the making of white gold is more modern, but we fancy that at least historic rings were not plated. This means that our 14K white gold puzzle rings, which are not rhodium plated, don’t match bright white, rhodium-plated wedding bands in color. It just so happens that makers of traditional and contemporary posy rings also do not rhodium plate their rings (many are licensed reproductions of historic rings), and it also so happens that the color of the white gold of the posy rings looks great with our 14K white gold puzzle rings which also have a slightly creamy cast to them. We have ordered an Irish Celtic wedding ring in 14K white gold without rhodium plating for a customer, but the white gold had a bit of a pinkish cast, so it didn’t really match the puzzle ring. Our client opted to have both rings plated in rhodium. Yes, you can have your 14K white gold puzzle ring rhodium-plated if you wish, by your local jeweler. We have other customers who have done so, and it’s really okay to do this if you want to. Then your ring will need to be occasionally replated. 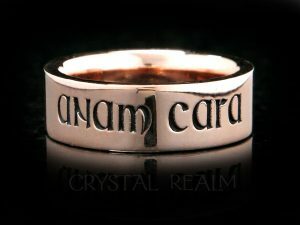 This is an option if you really want 14K white gold and a shadow band or a Celtic wedding ring. 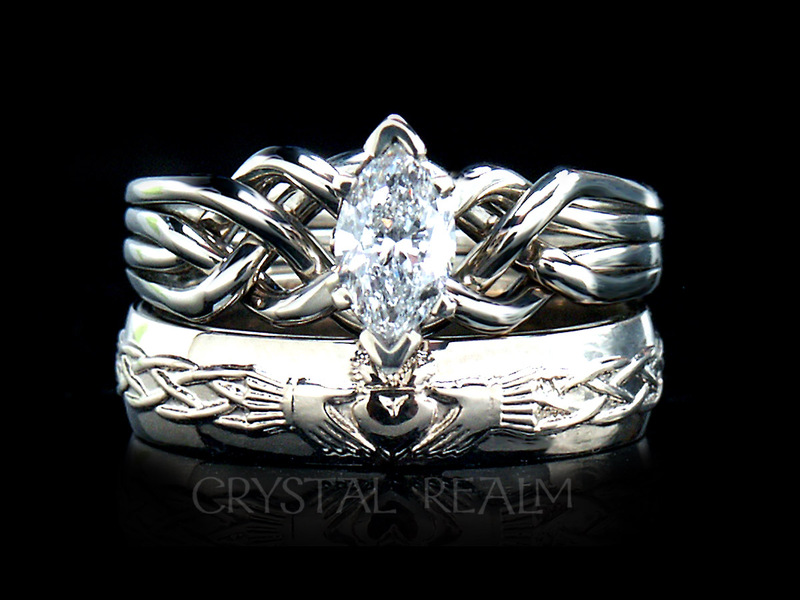 Otherwise, we normally suggest going with palladium (a white, platinum-family metal) or platinum for your Celtic bridal set or your shadow band bridal set. These rings will all match in color. What About Multiple Colors in Your Bridal Set? If you want multiple colors in the engagement puzzle ring, and you want a wedding band, we normally suggest that you have the wedding band match the outer colors of the engagement puzzle ring. Notice that in the puzzle ring below, there are two types of bands: The X in the front of the ring is composed of 14K rose gold. The minor bands, which form the front center loops of the puzzle ring and which also form the edges of the shank of the puzzle ring are white. They are palladium in this case. We made the shadow band palladium, so that it matese with the palladium forming the edges of the shank of the puzzle ring. This way there is a consistent, rather than a choppy, look to the set. Whatever you want, please talk to us. 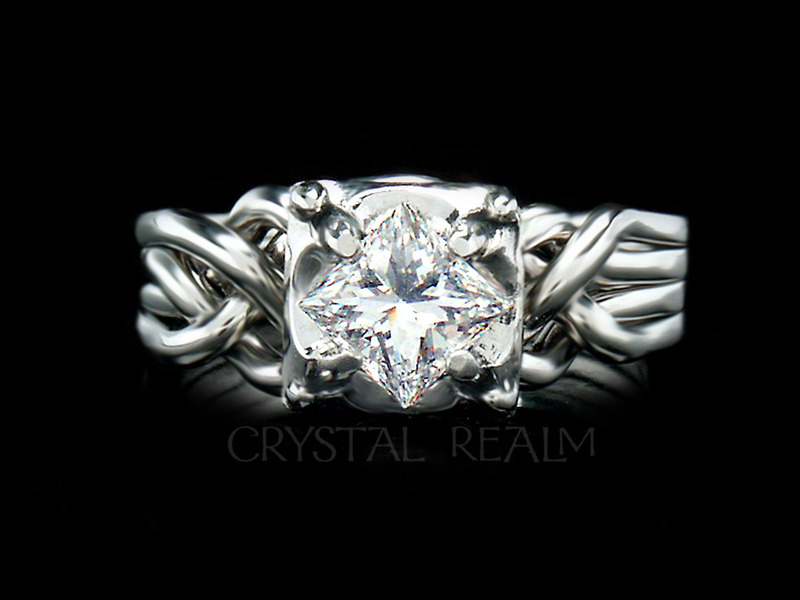 We can make your rings exactly as you wish them. We are happy to make recommendations to help you realize just the bridal set you envision.